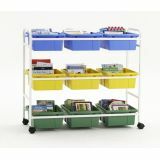 These carts are 49"W x 36"H and contain 9 colored tubs. Lifetime tub warranty; 10-year frame warranty. 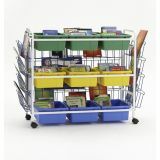 Versatile 2-sided unit fits perfectly in the reading area of any classroom, with storage for books on one side and markerboard on the other. Rolls on heavy-duty casters. Lifetime warranty. 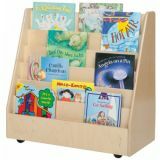 30"H x 30"W x 15"D. Made with 100% Healthy Kids Plywood and our exclusive Tuff-Gloss UV finish. 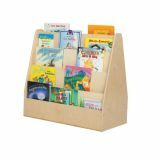 Five sloping plywood shelves provide ample space to display books or store coloring books with 4 additional storage shelves on back side. Fully assembled. 15"D x 29"H x 30"W. Weight 50 lbs. Greenguard® Gold certified. 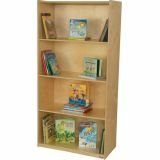 This oversized bookcase is perfect for teachers who want to store items our of reach of students. Three fixed shelves and extra deep 18" depth provide ample storage. 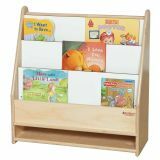 36"W x 18"D x 72"H.
Three book shelves, with an additional storage area for materials below, is a perfect fit for any toddler classroom. A markerboard on the back side of unit provides extra writing surface. All surfaces are 100% plywood with UV finish. 25"H x 24"D x 9"D.